This sandwich is packed with full nutrition. It's absolutely filling and nutritious; Also a mild spicy sandwich. 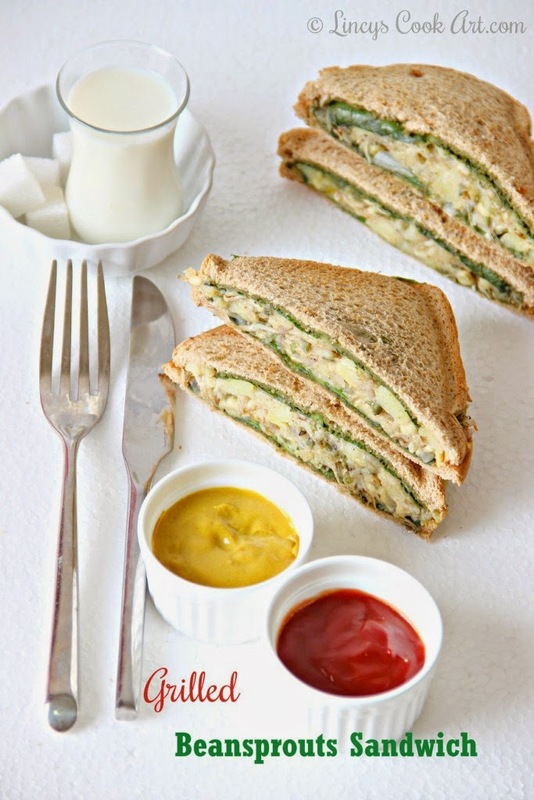 Kids loves the Beansprouts Egg Sandwich and adults would also love this sandwich. Easy to make in minutes. The taste is just amazing. A must try sandwich with crunchy outside the inner spicy chutney and the beansprouts potato filling is delicious with a nice textural combination too. Here I have grilled the sandwich, but you can eat it without grilling the sandwich too. If you are not planning to eat after making the sandwich do not add Lettuce leaves in your sandwich. It may gives a light bitter and wilted taste after grilling and if kept for long time. 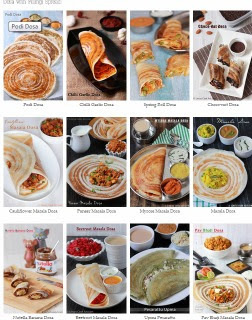 Just apply the chutney, keep the filling inside and grill it. Pressure cook or Boil potatoes till soft for about 3-4 whistles on medium flame. After the steam releases allow them to cool and peel them. Grind coriander, mint leaves, green chillies, sugar, salt together as a fine paste to make green chutney. Pulse two to three times then add 1/4 cup of water and grind as a smooth paste. In a pan heat a teaspoon of oil and cook the onion for a minute. Now add the beansprouts and little salt and cook for a minute more. Now add the Chaat masala/ Garam masala, pepper powder and cook for further a minute. Switch off the gas and allow to cool the mixture. Mash cooked potatoes well in a bowl and add the beansprouts mixture. Mix together and season with pepper and salt. 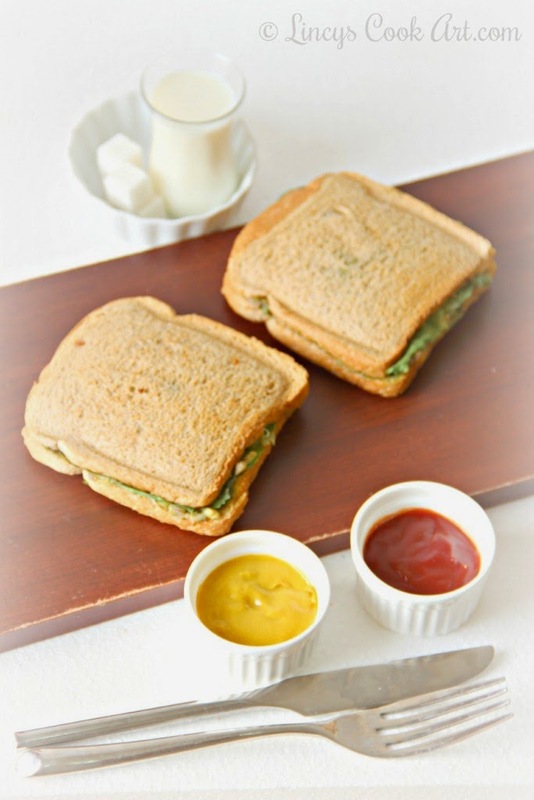 Take the bread slices and apply green chutney on both the sides. Keep a lettuce leaf and spread the filling on top evenly with a spoon or palate knife. Cover the filling with another lettuce leaf and with another bread slice. Preheat the sandwich maker and grill/ toast for 2 minutes till the bread slices gets light brown toasted colour. Note: You can add roasted channa dhal/ chick peas while making green chutney to give little thickness and volume. Very healthy and nutritious breakfast! Healthy and tasty sandwich !! One more interesting sandwich with beans sprouts,loving it.